Malacañan Palace as viewed from the Pasig River. The Malacañan Palace (officially Malacañan Palace, colloquially "Malacañang" Filipino: Palasyo ng Malakanyang ; Spanish: Palacio de Malacañan) is the official residence and principal workplace of the President of the Philippines. 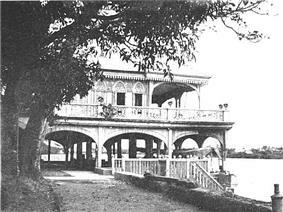 The original structure was built in 1750 by Don Luís Rocha as a summer house along the Pasig River. It was purchased by the state in 1825 as the summer residence for the Spanish Governor-General. After the June 3, 1863 earthquake destroyed the Palacio del Governador (Governor's Palace) in the walled city of Manila, it became the Governor-General's official residence. After sovereignty over the Islands was ceded to the United States of America in 1898, it became the residence of the American Governors, with Gen. Wesley Merritt being the first. Since 1863, the Palace has been occupied by eighteen Spanish Governors General, fourteen American Military and Civil Governors, and later the Presidents of the Philippines. The Palace had been enlarged and refurbished several times since 1750; the grounds were expanded to include neighboring estates, and many buildings were demolished and constructed during the Spanish and American periods. Most recently, the Palace complex was again drastically remodeled and extensively rebuilt during the rule of Ferdinand Marcos. Among the presidents of the present Fifth Republic, only Gloria Macapagal-Arroyo has actually lived in the main Palace, with all others residing in nearby properties that form part of the larger Palace complex. The official etymology word from the 1930s says the name comes from the Tagalog phrase "May lakán diyán" ("there is a nobleman there"), and as it was originally the home of a wealthy Spanish aristocrat merchant by the river. The Spaniards meanwhile claimed the name came from the term "mámalakaya", referring to the fishermen who once laid out their catch on the river bend where the Palace now stands. A more mundane claim is that the Palace was christened after the old name of street along which it was located, Calzada de Malacañáng (English: Malacañang Street). The Rocha family meanwhile holds that the term “Malacañáng” is directly attributed to Luís Rocha. In a 1972 interview by Ileana Maramag, Antonio Rocha related that his ancestor would take siesta in the house that he had built and that his Sikh watchman would hush any noisy passers-by. The watchman would say "Malakí iyán" (“he is [a] big [man]”) whilst gesturing towards the house. Another probable origin is the name being a point of reference for ancient water traffic on the Pasig. When heading downstream, the area of the present-day Palace is on the right bank of the Pasig, and the Tagalog word malakánan means "of the right." The river is somewhat long and meandering, with a lengthy right bank, and its only division is at the Isla de Convalecencia located a little further downstream, hence the need to distinguish between its left and right forks. The Palace façade featured on the briefing room signage. In current political and common parlance, "Malacañang" and "the Palace" has become metonyms for the Presidency, the executive branch and by extension the national government as a whole. Whatever the origin, the word Malacañang is indisputably Tagalog. During the Spanish Colonial Era, Spanish language books published during the era spelled the word as Malacañang (not Malacañán). Early Spanish plans for the palace spell the name as Malacañang. The name was allegedly changed to "Malacañan" during the American occupation of the Philippines from 1898 until 1946, despite the fact that "-ng" as a final sound is very familiar in the English language. However, after the inauguration of President Ramon Magsaysay on December 30, 1953, the Philippine government changed the name to Malacañang: Residence of the President of the Philippines in honor of Palace's historical roots. During the administration of President Corazon Aquino, for historical reasons, government policy has been to make the distinction between "Malacañan Palace", official residence of the President and "Malacañang", Office of the President. The restoration of the designation "Malacañan Palace" was reflected in official stationery, and signage, including the often seen backdrop in the press room modeled after the White House sign. In practice, the heading Malacañan Palace is reserved for official documents personally signed by the President, while those delegated to and signed by subordinates use the heading Malacañang. The Spanish Captains-General (before the independence of New Spain, from which the Philippines was directly governed) and the later Governors-General originally resided at the Palacio del Gobernador (Governor's Palace) fronting the city square in the walled city of Intramuros in Manila. Malacañan Palace was originally built as a casita (or country house) in 1750 – made of adobe, wood, with interiors panelled with finest narra and molave. It sits in a 16 hectare land owned by Spanish aristocrat Don Antonio V. Rocha. It was subsequently sold to Col. José Miguel Formento in November 16, 1802 for a sum of thousand pesos. Later it was sold to the government upon his death in January 1825. It became the temporary summer residence of the Governors-General when the heat became unbearable in Intramuros with its gardens and a verandah along the wide river. Rafael de Echague y Berminghan, previously Governor of Puerto Rico, became the first Spanish Governor-General to reside in the Palace. Finding the place too small, a wooden two-story building was added to the back of the original structure, as well as smaller buildings for aides, guards and porters, as well as stables, carriage sheds and a boat landing for river-borne visitors. Between 1875 and 1879, reconstruction and expansion resumed after the Palace was hit by more earthquakes, typhoons and fire. An 1869 earthquake hit Malacañang, thus, repairs are made urgent. Posts and supports were repaired or replaced. Balconies are reinforced. Cornices are provided for the roof. Roofing was replaced with G.I. roofing (formerly tile roofs) to lighten loads to the walls. The interior was refurbished. By the end of Spanish rule in 1898, Malacañan Palace was a rambling complex of mostly wooden buildings that had sliding capiz windows, patios and azoteas. When the Philippines came under the American sovereignty following the Spanish–American War, Malacañan Palace became the residence of the American Governor-General. Gen. Wesley Merritt became the first American Military Governor to reside at the Palace in 1898, while William Howard Taft became the first Civil Governor resident in 1901. They continued to improve and enlarge the Palace, buying more land and reclaiming more of the Pasig River. From 1875 up to 1879, renovations were conducted. Left and right wings were added. An azotea facing the river was joined to the existing azotea. A staircase was transferred to the center of the foyer; and galleries were built around the stairway where the public could circulate during crowded receptions. Ground level was raised above the flood line, replacing wood with concrete, and beautifying the interiors with hardwood panelling and adding magnificent chandeliers. Emilio Aguinaldo, recognized as the first Filipino president but of the revolutionary government, the First Philippine Republic, established during the Spanish rule. He did not reside but was later taken to the Palace by the Americans as a political prisoner for a few weeks in 1901 after his capture in Palanan, Isabela. He resided in is private home as president, now the Aguinaldo Shrine, in Kawit, Cavite. Malacañan Palace survived the Second World War, the only major government building left standing after the Bombing of Manila. Only the southwest side of the Palace—which would have been the State Dining Room and its service area—was damaged by shelling. 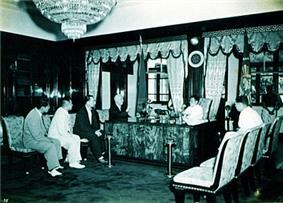 During the Second World War, in 1942, Japanese turned Malacañang into a gilded prison. Quezon moved his seat to Corregidor, the headquarters of General Douglas MacArthur. The longest residents of the Palace were President Ferdinand Marcos and his wife, Imelda, who resided there from 1965 to 1986. Following a student uprising that nearly breached the Palace gates in the early 1970s, Martial Law was declared, and the Palace complex and its surrounding neighbourhood was closed to the public. Several changes were implemented to beautify the Malacañan Palace. Servant quarters was transformed — today what we know as Premier Guest House. 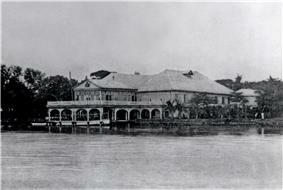 The veranda overlooking Pasig River was walled up to become the new Maharlika Hall. Across the river, a guest house was constructed. It is situated on the grounds of Malacañang Golf Club. It is then called Bahay Pangarap. When Marcos was overthrown during the 1986 People Power Revolution, the Palace complex was stormed by protesters who roamed the grounds. The international worldwide media subsequently exposed the excesses of the Marcos family that had hours before fled to Hawaii, including Mrs. Marcos' infamous collection of thousands of shoes. The main Palace was later reopened to the public and was converted into a museum for three years of nobody in position due Ferdinand's responsible martial decree. After his exile, a lifestyle of excess was revealed. Some includes 15 square feet of sunken bathtub with mirrored ceiling and an altar with 19th century religious statuary of ivory with gold-embroidered robes. In an effort to distance herself from the decadence of the Fourth Republic, President Corazon Aquino chose to live in the nearby Arlegui Mansion but held government affairs in the Executive Building. Her successor, President Fidel Ramos, followed suit. After the Second EDSA Revolution, security in the Palace was tightened due to attempts against the government. 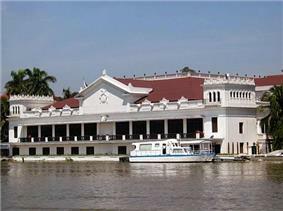 His First Lady restored Bahay Pangarap, and later it became the extension of Malacañang Ceremonial Hall. The chapel was also retained despite different religious points-of-view (former President Fidel V. Ramos was a Protestant). 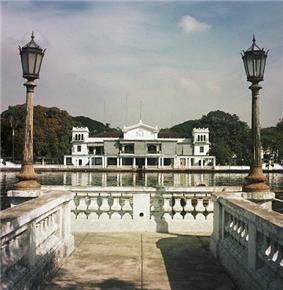 Aquino's son, the current President Benigno Aquino III, resides in Bahay Pangarap, a guest villa on the south bank of the Pasig River across the main Palace, in which he works and entertains, and keeps open to the public. The Malacañan Palace contains 10 current main existing halls some restored from historical times. 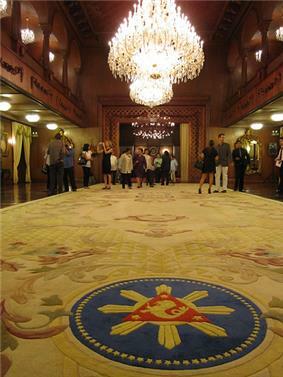 Official visitors to Malacañan Palace use the Entrance Hall. Its floor and walls are of beige Philippine marble. Straight from the entrance hall are the doors to the Grand Staircase leading to the state reception rooms. To its left is the Palace chapel and the passage to the right leads to Heroes Hall. The painting on the right begins with the Battle of Tirad Pass and Gregorio Del Pilar and other events of the Filipino-American War, the Independence Movement under Osmeña and Quezon, events of the Japanese occupation, and the Presidents of the Philippines all the way to the Marcoses, President Corazon Aquino, and President Ramos. Official portraits of all Philippine Presidents are on the walls, from Emilio Aguinaldo, President of the Malolos Republic, to Benigno Aquino III, painted by Fernando Amorsolo, García Llamas and other noted artists. The first portrait of President Arroyo in this hall was a photograph taken by Rupert Jacinto. That of President Fidel Ramos is unique on three counts – it is on a narra plank rather than on canvas, the likeness as well as the decorations along the sides are painstakingly singed on the wood and it was a gift of the artist, Gaycer Masilang, a prisoner serving a life sentence. Two paintings dominate the room. The larger is a fiesta scene by National Artist Carlos Botong Francisco – a pair of tinikling dancers, a serenade, churchgoers, boatmen, and other vignettes of rural life. Commissioned for the Manila Hotel, it originally hung in one of the hotel lobbies but was transferred to Malacañan Palace in 1975. The other painting is an early Amorsolo rural scene. 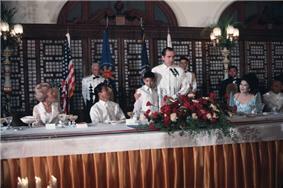 Richard Nixon visits Philippine President Ferdinand Marcos and his wife Imelda and son Ferdinand, Jr. in Malacañan Palace. ... I was ushered into the office of General Arthur MacArthur, the father of the hero of the Battle of the Philippines. ... [The interpreter]... told General MacArthur in English what I had said in Spanish, namely, that I was instructed by General Mascardo to find out if General Aguinaldo had been captured. The American General, who stood erect and towered over my head, raised his hand without saying a word and pointing to the room across the hall, made a motion for me to go in there. Trembling with emotion, I slowly walked through the hall toward the room hoping against hope that I would find no one inside. At the door two American soldiers in uniform, with gloves and bayonets, stood on guard. As I entered the room, I saw General Aguinaldo the man whom I had considered as the personification of my own beloved country, the man whom I had seen at the height of his glory surrounded by generals and soldiers, statesmen and politicians, the rich and the poor, respected and honored by all. I now saw that same man alone in a room, a prisoner of war! It is impossible for me to describe what I felt, but as I write these lines, forty-two years later, my heart throbs as fast as it did then. I felt that the whole world had crumbled; that all my hopes and dreams for my country were gone forever! It took me some time before I could collect myself, but finally,I was able to say in Tagalog, almost in a whisper, to my General: Good evening, Mr. President. President Ramon Magsaysay (1953–1957) at the Presidential Study, Malacañan Palace. Mrs. Marcos decorated the room in mint green. She would sit on the antique French sofa and the visitors on the armchairs. On rare occasions, small concerts were held here, featuring famous Filipino and foreign musicians. The room immediately behind the Music Room was set up by Mrs. Marcos as her office. It later became President Fidel Ramos' private office. 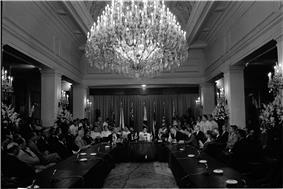 The room beyond was originally a small sitting room and was converted by President Joseph Estrada into his own office. President Arroyo decided to use the room as her office at first. Today, the room is used by the President to receive visitors. The Palace has always been impressive, particularly the grand reception rooms, but the Presidents' families have not always been happy over the domestic concerns of bedroom size, privacy, closet space, ventilation, color scheme, and so on. Each new presidential couple took their pick of the available bedrooms, each President frequently avoiding the bedroom of his predecessor. A President with many children or grandchildren usually had problems, particularly when a foreign head of state arrived, expecting to be invited to stay in the Palace such as when Indonesian President Sukarno visited President Quirino shortly after the war, like many personalities who have stayed beforehand in Malacañang over the years. It is recounted that the Prince of Wales, later King Edward VIII, dropped by in the 1920s to play polo. American and Asian heads of state have stayed at Malacañan Palace on visits to Manila. Bedroom Suites. The bedroom suites (one baptized by Mrs. Marcos as the King's Room and another, the Queen's Room) open from the former private dining room, between which is a small sky-lit room that used to be a courtyard. These are furnished with large canopy beds, gilded wardrobes and the like. The King's Room leads to the balcony over the main entrance, from which Pope John Paul II blessed a waiting crowd during his 1981 Philippine visit and which President Arroyo confides was her bedroom as the young daughter of President Diosdado Macapagal. The Spanish period "Malacañan Palace" probably centered on the small, open-roofed inner court that leads to all areas of the private quarters. The rooms opening to the Grand Staircase were the Dining and Living Rooms and guest suites of the Marcos period. These became meeting rooms during the Ramos and Estrada administrations and reverted to being the private quarters of the presidential family under President Arroyo. The Old Executive Building now Kalayaan Hall, now the oldest part of the Palace, was constructed in 1920 Governor General Francis Burton Harrison. 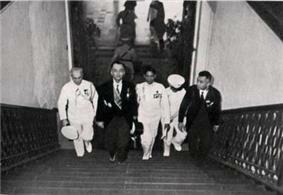 Till then, the Governors General had to commute daily to their office at the Ayuntamiento Building in Intramuros. Gov. Gen. Leonard Wood was the last chief executive to hold office there and the first in Malacañan Palace. It was their first concrete structure in the palace grounds and was enlarged over the years until 1939. It combines the histories of the American, Commonwealth, and Second and Third Republics, on the grounds of the picadero pavilion of the Spanish period. The Presidential Museum and Library, formerly Malacañang Museum, the official repository of memorabilia of the President of the Philippines, is located in Kalayaan Hall. It was established in 2004 when the Presidential Museum and Malacañang Library were merged into the Malacañang Museum the renamed to its present name in 2010. The Gallery of Presidents features exhibits and galleries showcasing the heritage of the Presidents beginning from Emilio Aguinaldo to the present. It is composed of objects and memorabilia – including clothing, personal effects, gifts, publications and documents of former presidents as well as the artwork and furniture from the Palace collections. The former bedroom of Imee Marcos had an antique gilded arch made by Isabelo Tampingco, carved to represent a coconut tree complete with fruit and leaves. Shelves held her collection of 19th century French porcelain dolls. At one time, now-Senator Ferdinand Marcos, Jr. lived elsewhere and used his room to practise golf. Nets were hung on all walls to catch flying balls. The current Administration Building or Mabini Hall on Ycaza Street is the large structure to the left upon entering Gate 4. It began as the Budget Building upon the creation of the Budget Commission (now the Department of Budget and Management) in 1936. After World War II, it temporarily housed the Supreme Court, as the Ayuntamiento building wasdestroyed during the Battle for Manila in February 1945. After the war, it was later expanded with wings and top floors added. It houses the Office of the Executive Secretary, some units of the Department of Budget and Management, and offices of Presidential assistants and advisers. Some offices in this building, particularly those of the Office of Media Affairs, were invaded by an unruly mob on the evening of February 25, 1986, during the storming of Malacañang that capped the People Power Revolution. After it was gutted in a fire in 1992, plans to demolish it and build a high-rise building in its place were completely dropped due to budgetary constraints. President Fidel V. Ramos supervised its reconstruction into a spartan but well-ventilated and lit office complex, and renamed it Mabini Hall, after Apolinario Mabini. In 2003, President Gloria Macapagal–Arroyo renamed this building Bonifacio Hall in honor of Andrés Bonifacio. The private office of current President Benigno S. Aquino III is located at the Aquino Room in Bonifacio Hall, a building . After the building's structural integrity was called into question, Aquino's office was temporarily moved to the Presidential Study on June 21, 2011. 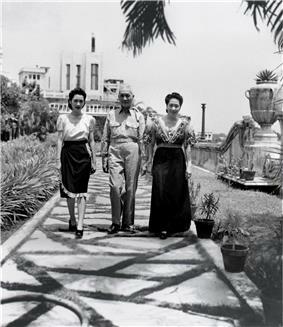 President Sergio Osmeña (1944–1946) and his family at the Malacañang gardens. At the main entrance is the large balete tree with a reputed resident kapre. Usually lit with capiz shell globe lights, it is hung with multicolored star lanterns during Christmas. One time only, it was lit with thousands of flickering fireflies, captured from some distant towns where fireflies still abounded and released as a grand ephemeral gesture of a present for the then First Lady. Malacañang Park, directly across the river from Malacañan Palace, adjoins the Mabini Shrine and the former quarters of the Presidential Security Command and of the National Intelligence and Security Agency. It boasts a Recreation Hall, a small golf course and the guesthouse Bahay Pangarap. In the subsequent presidency of Ferdinand E. Marcos, Malacañang Park became increasingly identified with the Presidential Guards. It was during the Marcos administration that the Bureau of Animal Industry building became the headquarters of the Guards (known today as Presidential Security Group (PSG)). General Fabián Ver gained jurisdiction over some of the historic buildings, including the recreation hall, which became (and remains) the PSG gymnasium, and the community assembly hall which was turned into the presidential escorts building. Malacañang Park, though, has always been a recreational park and not a military facility. The facilities and area of the PSG are distinct from the demarcation of Malacañang Park. In 2008, the historic Bahay Pangarap was essentially demolished by Conrad Onglao and rebuilt in contemporary style (retaining the basic shape of the roof as a nod to the previous historic structure), replacing, as well, the Commonwealth-era swimming pool and pergolas with a modern swimming pool. It was inaugurated on December 19, 2008 by President Gloria Macapagal-Arroyo at a Christmas reception for the Cabinet. Administrative Order Nº. 251, issued on December 2008, placed the administration of Bahay Pangarap under the Internal House Affairs Office of the Office of the President of the Philippines. President Benigno S. Aquino III became the first President of the Philippines to make Bahay Pangarap his official residence, although previous presidents have stayed there. Despite living at his private residence at the start of his term, he has since occupied the house as of August 2010. Laperal Mansion or the Arlegui Guest House is a remodeled and enlarged 1930s mansion located along Arlegui Street, half a block away. When World War II broke out, it served at one point as the residence of the speaker of the National Assembly established by the Japanese puppet state, Second Philippine Republic, Benigno S. Aquino, Sr., the grandfather of current Philippine president Benigno S. Aquino III. When the war ended, it served temporarily as the National Library. Around the early postwar era that the Laperal family acquired the property. In 1975, the property was seized by the presidential security forces under Marcos for “security reasons". The house became the office of the Presidential Economic Staff (precursor of today’s National Economic and Development Authority) before former First Lady Imelda Marcos decided to expand the house to grander proportions to become a guesthouse, giving the building two turrets when it used to have one. Legarda Mansion was built in 1937 by Doña Filomena Roces y de Legarda, one of the first art deco houses built in Manila. In this house, Alejandro Legarda, the son of Doña Filomena, lived with his wife Ramona Hernández, and their four children. Doña Ramona was well known for her lavish parties. The Legarda house is a tribute to Doña Ramona (Moning), as it houses La Cocina de Tita Moning, a fine dining restaurant that aims to recreate the wonderful parties of Manila’s most elegant era, using heirloom recipes of the Legardas, served on antique china, glassware, and silverware. The house includes living room with paintings by Felix Resurreccion Hidalgo and Juan Luna, Don Alejandro’s collection of antique radio equipment, a dressing room showcasing the memorabilia of the Legarda women, and the dining room where banquets are held. The marker of Malacanan Palace was installed in 1941 at Malacañan Palace site, San Miguel, Manila. It was installed by Philippines Historical Committee (now National Historical Commission of the Philippines). ^ Quezon, Manuel III L. (2005) Malacañan Palace: The Official Illustrated History Studio 5 Publishing, Manila, ISBN 971-91353-9-5"
^ a b De Moya y Jimenez, Francisco Javier (1882). "Las Islas Filipinas en 1882: estudios historicos, geográficos, estadísticos", pg. 274. El Correo, Madrid. ^ Montero y Vidal, D. Jose (1895). "Historia General de Filipinas, Tomo III", pg. 504. Impreso de Camara de S. M., Madrid. ^ Sociedad Geografica de Madrid (1886). "Boletin de la Sociedad Geografica de Madrid, Tomo XXI", pg. 274. Imprenta de Fortanet, Madrid. ^ "Government and Administration". Discovering Philippines. Retrieved on 2013-06-15. ^ a b c d e f g h i "Museum". Office of the President of the Philippines. Retrieved 2011-03-28. ^ (2012-10-12). "Malacañan Palace Prowlers: Ghosts, elementals, and other phantasmagoric tales". Presidential Museum & Library. Retrieved on 2013-06-16. ^ Conde, Chichi (2011-07-05). InterAksyon.com: "Aquino moves to Palace study as Bonifacio Hall office undergoes repair" InterAksyon.com. ^ Enriquez, Marge C. (6 June 2010). "New President can live in style but homey House of Dreams". Inquirer.net. Retrieved 7 March 2012. ^ Esguerra, Christian V. (30 July 2010). "RP’s most tightly guarded bachelor’s pad is ready". Inquirer.net. Retrieved 7 March 2012. ^ . Wikimedia Commons. Retrieved on 2013-06-15.